I’ve previously written about my opinion on seeking work with the aim of making an impact on the world. I believe that, while considering career options, that criterion must be given weight, but not too much. This struck me when I realised that, in my own search for a career, I had been focusing on making an impact more than I should have, and it was causing me distress. Any attempt to change one’s belief systems, even if the change is minuscule, requires a certain amount of persistence. Changing one’s perspective, although not quite as drastic as learning the rules of physics all over again, needs sustained efforts. To be able to bring about the change, as my maths teacher once said while teaching calculus, requires that the idea to be drilled into your head. In an attempt to do that, I am going to try and share some stories from the past about people who believed in doing the work, regardless of the impact it would eventually have on the world. 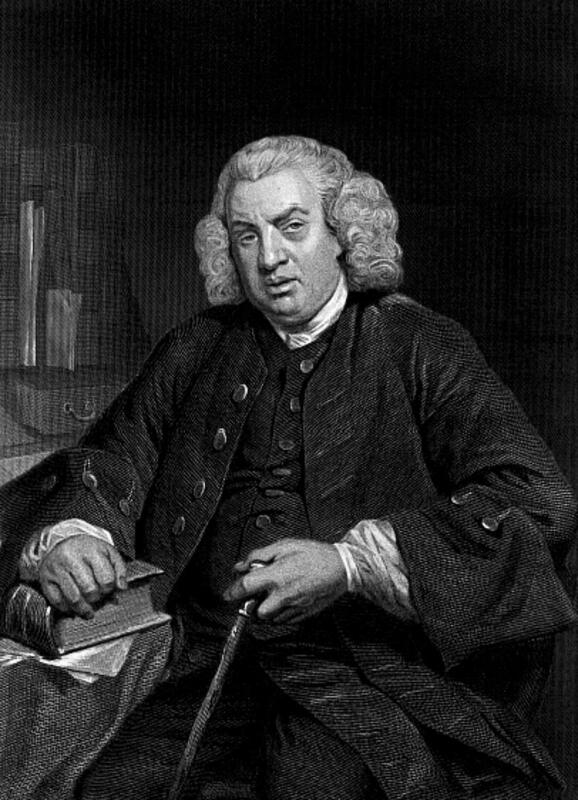 The first story is that of Samuel Johnson, who produced the first reliable dictionary of the English language. The first dictionary of the English language was written by an English schoolteacher in 1604, with 2500 words in it. But in 1741, David Hume lamented that the language has been neglected by scholars, and there is no ‘Dictionary of our Language’, probably because what was was published till then was merely a ‘word-book’, not a dictionary in the true sense of the word. Oxford English Dictionary says a dictionary is: A book which explains or translates, usually in alphabetical order, the words of a language, giving for each word its typical spelling, an explanation of its meaning or meanings, and often other information, such as pronunciation, etymology, synonyms, equivalents in other languages, and illustrative examples. In the early 18th century, there seemed to be a number of dictionaries, but none that could set as the ‘standard of our language‘. In 1746, Johnson was contracted to write a dictionary. Despite not having completed his formal education at Oxford (because of lack of funds), he had proved himself to be a master of the English language and to be proficient at many others. He promised to complete the project in three years, which was a promising a little too much, given that the French, who had recently completed a dictionary of their language, had forty scholars working on it for forty years. Such was the importance of the dictionary at the time that Oxford University awarded Johnson a Master of Arts degree in anticipation of the work. He worked tirelessly with only a few assistants, who were employed for mechanical work, and completed the task in nine years to produce the Dictionary. Of the event of this work, for which, having laboured it with so much application, I cannot but have some degree of parental fondness, it is natural to form conjectures. Those who have been persuaded to think well of my design , require that it should fix our language, and put a stop to those alterations which time and chance have hitherto been suffered to make in it without opposition. With this consequence I will confess that I flattered myself for a while; but now begin to fear that I have indulged expectation which neither reason nor experience can justify. When we see men grow old and die at a certain time one after another, from century to century, we laugh at the elixir that promises to prolong life to a thousand years; and with equal justice may the lexicographer be derided, who being able to produce no example of a nation that has preserved their words and phrases from mutability, shall imagine that his dictionary can embalm his language, and secure it from corruption and decay, that it is in his power to change sublunary nature, or clear the world at once from folly, vanity, and affectation. He died in 1784, less than 30 years after the publication of the Dictionary, and would not have known that, for the next 150 years, his dictionary would remain the English-language standard.